Monitoring Software | Planet TechEd Inc.
Educational technology has been developing new systems of monitoring classrooms and monitoring softwares have become a real need within instructors at schools, universities, etc. Classroom management technology is now one of the first priorities for every instructor interested in proving the best tools for the students. Monitoring softwares have as main feature, as it says on the name, the possibility of monitoring every student’s computer or device in order to secure the a productive learning process. 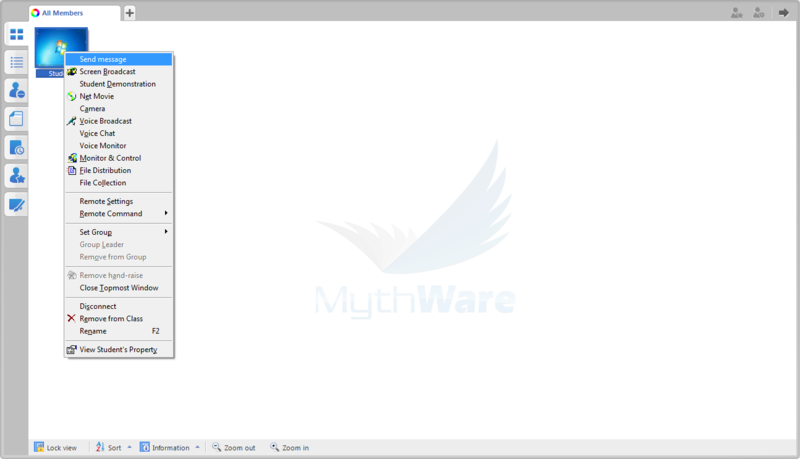 Mythware classroom management software provides this ability within many other unique features that allow every instructor to manage the classroom as needed and maintain every student focused on the lecture. These are some of the features Mythware classroom management software provides as a monitoring software, these are the best tools for the instructor to be able to maintain an organized and controlled classroom. It secures a succesful learning process and the students are able to achieve success in class. Monitor & Control – allows the teacher to control the learning progress and see in real time different student’s monitors from his/her computer. Blank Screen – this feature provide the instructor with a quick action button where he can blank the students screen showing a message is needed, in order to maintain the attention of specific students or all the classroom. The instructor can also block their input devices and mute their sound. Remote Command – Instructor can launch or close applications on a student’s computer, open a website, start up , reboot or shut down all computers with just a click on the mouse. Remote Settings – Instructor can set common functions for all computers and block the students screen if they disconect from the class. Mythware classroom management software has proven to be the best classroom management software in the area of monitoring software available in today’s market. A comparison between industry leaders such as NetOp, Lanschool and Mythware classroom management software will show which is better and worth investing. There are many different monitoring software in the market today but the main attribute it must have are the features in order to truly provide the tools both instructor and student need to have an organized and controlled classroom. Being able to have a monitoring software such as Mythware classroom management software, not only provides the monitoring needed but many other features in addition.